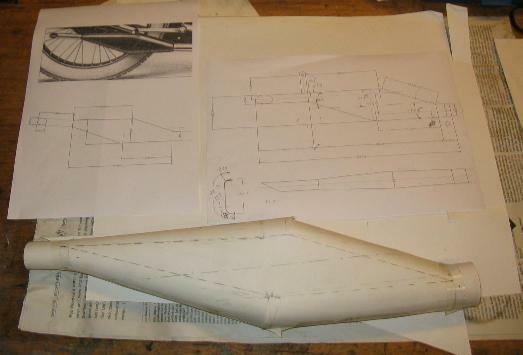 Making a silencer for my E.W. Douglas. Another sheet metal exercise! This one was the predominating one, and I think it is the correct one. I think this is an original catalogue picture. 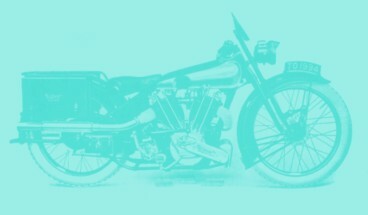 The shape is the same, but the picture makes me wonder how the silencer is connected to the exhaust pipe. Maybe just a push fit - or is this one of the much retouched catalogue pictures of the time? 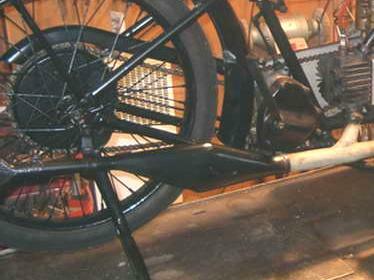 My old friend Juris from Latvia send me a few pictures and a sketch of the silencer on his 1926 E.W., which is in poor condition, but looks to be quite original. Thanks again for that Juris! 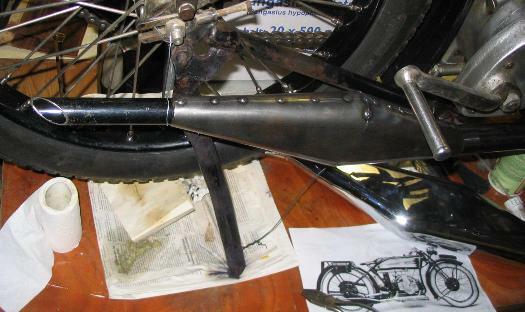 On his bike, the silencer is welded to the exhaust pipe. This may well be original, as I understand it was made detachable only from 1927 onwards. ...which I offered up to the bike. 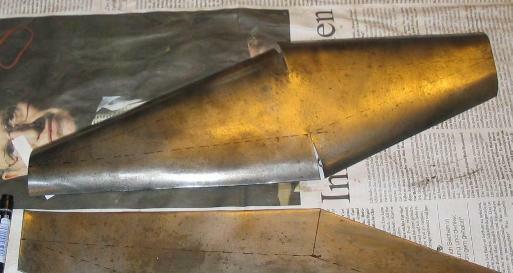 Well, paper is an odd material for an exhaust system, but apart from that it looked alright to me. ... and started to bend them. 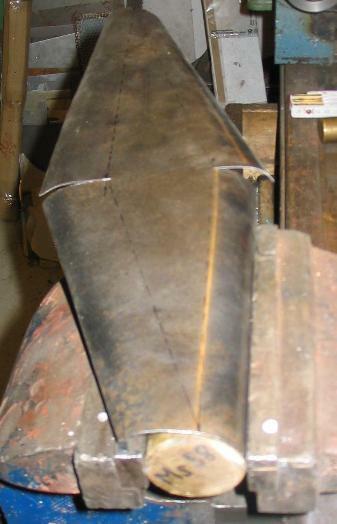 For making a radius bend up to the edge, I just clamp a suitable piece of bar stock into the vice, then I wedge the piece of sheet metal down into the narrowing gap between the bar stock and the vice jaw and bend it over. This is how it looks after performing this operation on the 4 edges. 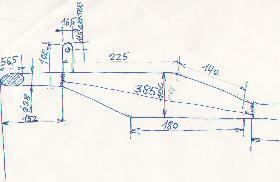 Well, a bit more, maybe, as on the rear end the radius needs to be 14mm, and about 25 in the middle. 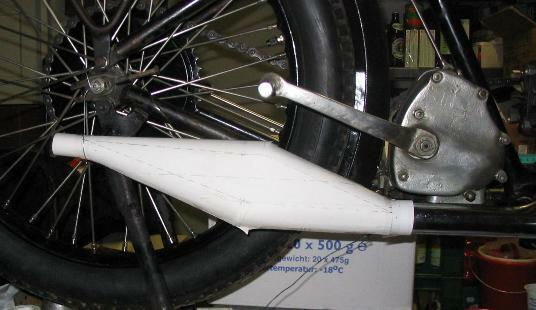 So I first made the big radius over the whole length, and the reduced it gradually towards the rear end. 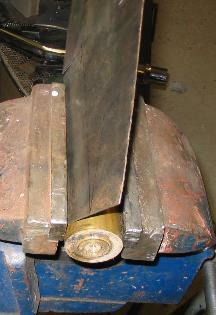 Now, clamping it between the bar stock and the vice jaw, I bent the edges over to a full 90 degrees. Things are taking shape now, aren't they? 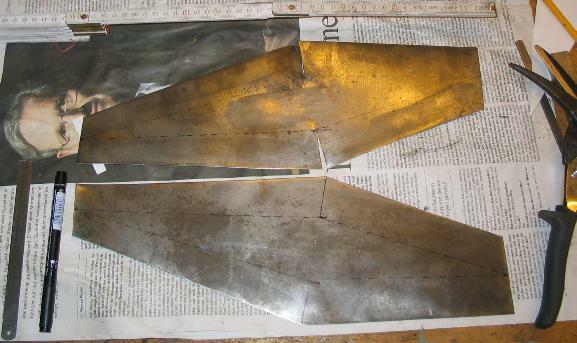 I had to learn, however, that a simple V-shaped cut-out as I had made it would make the both sides mate nicely. So, for the next half, I made a radiused cut-out. 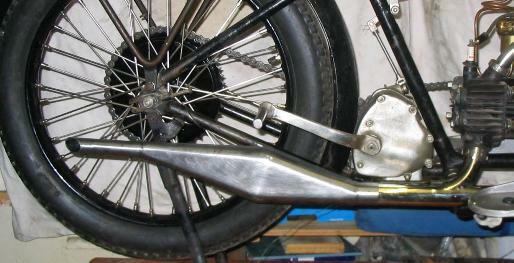 This, slightly re-dressed with a thin hacksaw blade, gave a nice welding gap. I still needed to round off the transition. This was not very difficult; I just held the piece onto the piece of brass bar, so the end would protrude a bit over the end of the bar and hammered a slight radius on it. 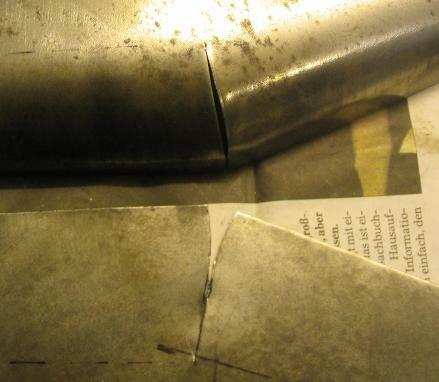 Now it was just a matter of carefully aligning the two halves, correcting bends here and there, filing a bit off the edge in a few places to make for a constant gap, and tack welding the halves together. This is how the silencer looks on the bike - I think it looks good. 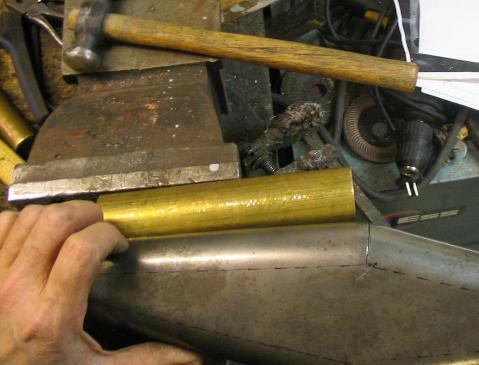 NO, I did NOT intentionally hide the silencer in the catalogue picture with the pair of pliers! 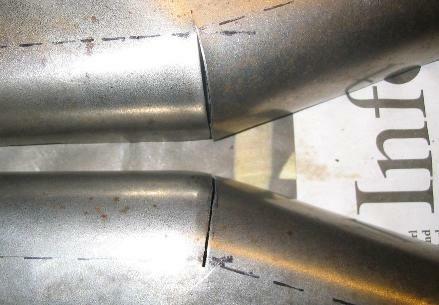 Ah, yes, I also etched the chroming off the exhaust pipes - the nickel beneath it came out quite ok.
By the way, I should not forget to mention a stupid mistake I made: I had machined the piece of tubing that accepts the exhaust pie to be a nice fit over the latter. 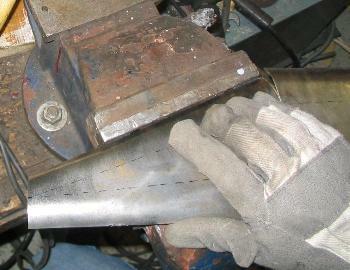 After welding it into the silencer body, it wasn't a nice fit any more, of course, as the weld had penetrated the tube wall in a number of places. I should either have made the inner diameter a bit larger in this area, or I should have brazed t into the silencer body. The fault could be corrected by careful filing, but it took lots of elbow grease!